“What’s that big bright thing in the sky? The sun?” says every Milwaukeean at the start of each summer. After recovering from shock, it’s your civil duty to gather your buddies together and find a patio to drink on. 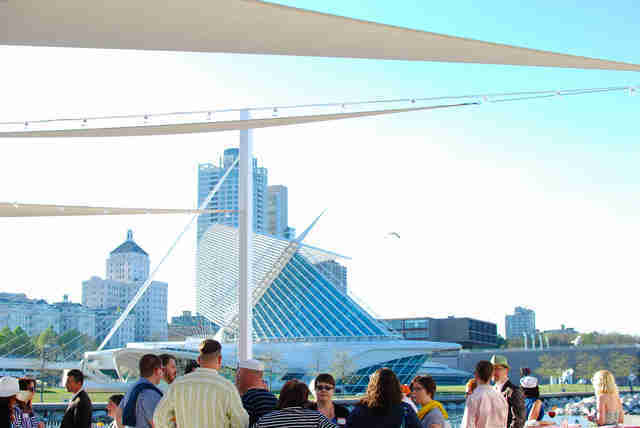 Here are the 11 best patios in MKE for drinking al fresco. Our own little slice of Key West is hidden behind industrial buildings and boat storage warehouses. 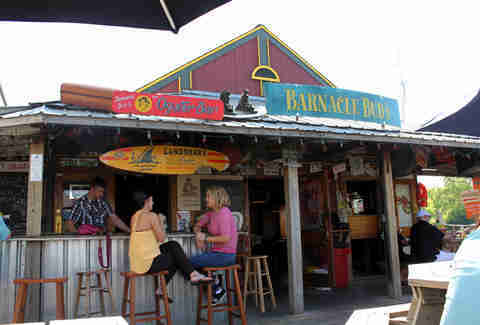 Turn left into the narrow parking lot at the end of the road and follow everyone else to the colorful shanty that serves up fried grouper sandwiches and neon drinks with names like dumpster punch. If only the river wasn’t so brown, you might actually believe you were in Florida. This seafood spot commands big bucks because of its location and arguably best view in the city, especially from the patio. Go for happy hour when lots of beers and cocktails are under $6 and there’s a selection of cheap seafood apps. 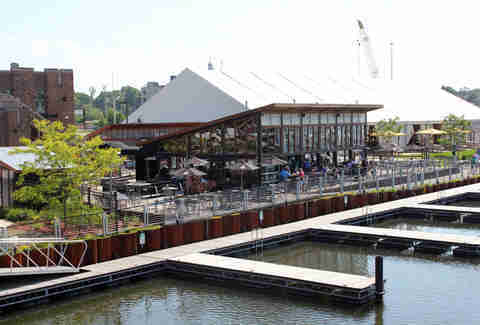 Throwing back oysters and pomegranate sangria on this patio is about the most chic thing you can do at the lakefront. This recently renovated second-story patio soars over bustling Brady Street. 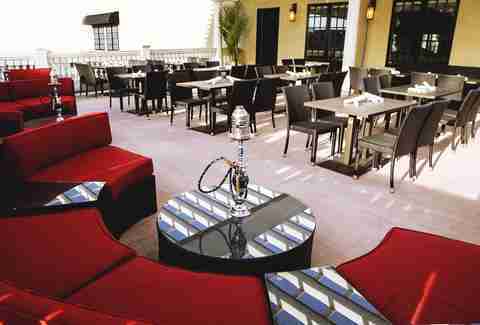 Sure you can sit at a boring table and eat (delicious) kabobs, but wouldn’t you rather melt into a comfy couch while puffing a hookah? Also, there are belly dancers. Check and mate. Being able to bring your own food into a beer garden means you can make some interesting pairings. Does a Jimmy John’s #11 go better with Riverwest Stein or Spotted Cow? Does a Crispin bring out the fruity notes in Chipotle’s hot salsa? Answer all those burning questions and more here, just don’t lose your $5 glass-deposit token. 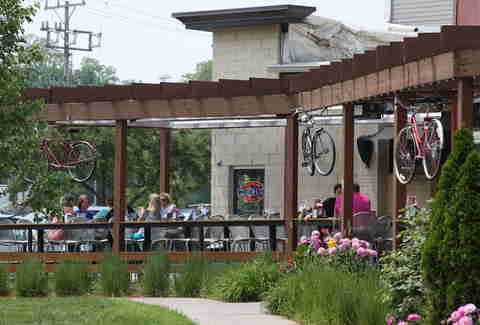 This sports bar has a nice big patio so not everyone has to pack into the bar like sardines to watch the Brewers in the playoffs (a girl can dream, OK?). For some big events, it even rents a giant billboard-like TV on a truck trailer and parks it adjacent to the patio, making it a prime sports-viewing spot. 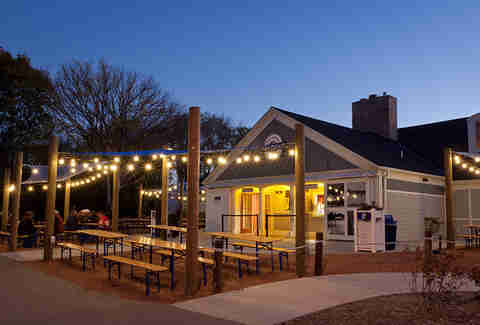 This patio has everything: a standalone bar with garage doors all around to make it open-air, lots of those fancy-pants fire pits that don’t use wood, a sandbox to keep kids occupied, boat docks, and a giant permanent tent with a stage for live music and heated sand volleyball courts. 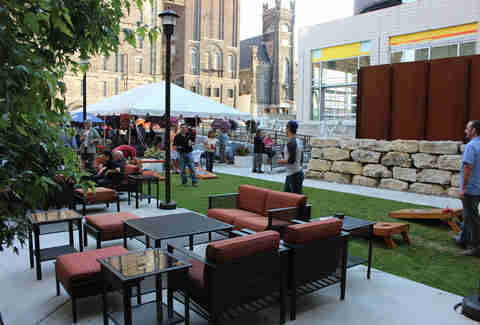 This is one of the only patios in MKE you can legit enjoy year-round, with a pitcher of Horny Goat Brewing’s beer in hand, of course. This is the most appropriately named bar in MKE. The huge side yard is a mishmash of lawn chairs, patio furniture, an outdoor bar, yard games, umbrellas, and a huge video screen for movies. 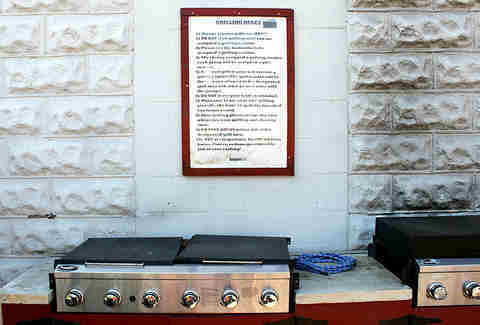 If that’s not enough, there are grills you can use for BYO meat. It’s like chilling at your buddy’s place, if your buddy had a well-stocked bar instead of the skunky Bud Light Lime in his fridge. Even your dog is welcome. 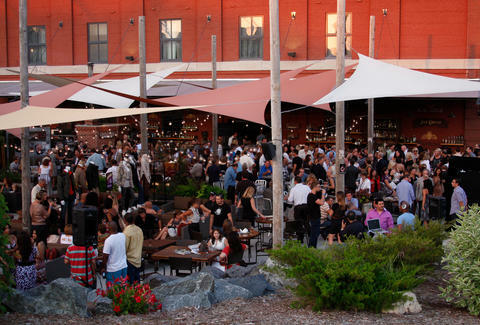 What better place to get your drink on than in the historic 1844 Pabst Brewery? Jackson’s has Wisconsin beers on tap, plus of course plenty of PBR, including the classy 40oz bottles. Sip one while rocking out to one of the many outdoor concerts this summer, or challenging a rival drinker to a game of bags. 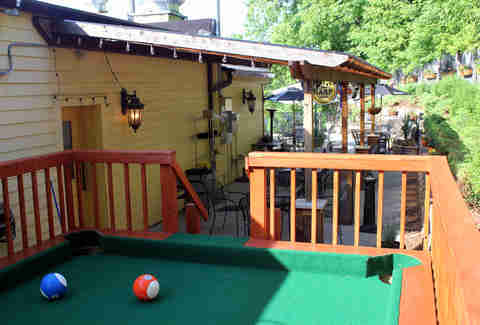 A unique patio game is tucked away around a corner on the second-story patio at Red Lion: poolball. It’s a giant AstroTurf-covered pool table deck that can only lead to hilarious antics once the drinks are flowing. Don’t worry though, the balls are soccer balls, not bowling balls, so you won’t break your foot when you try that trick shot. Try not to break anything of the pub’s, either. 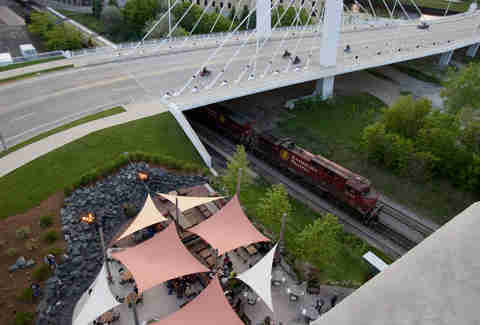 Though The Yard is in the Iron Horse Hotel, it’s not just for Harley riders. The decor is biker chic with dark wood, comfy couches, and fire pits. Eclectic bands play regularly and there are food specials like $2 sausage and bacon pigs in a blanket. One cocktail, the Escape Clause, is made with pink peppercorn- and heather flower-infused rum and is finished with a cedar-flamed orange disc. Fancy. This beer garden is of the decidedly German variety. Beers are from Hofbrau and come in the classic heavy-glass liters and half-liters; try not to klepto them. To soak up those giant beers, there’s giant pretzels, cold landjaeger sausage, and the quintessential bratwurst. 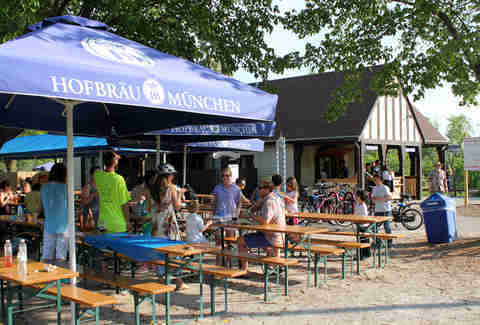 Along with the live accordion-playing polka musicians, you’ll feel like you’re actually in Munich. Lacey Muszynski is a writer in Milwaukee who is probably just as bad at poolball as she is at real pool. Follow her on Twitter: @worthhersalt.